At long last I write you! I want to wish you a happy Easter, if you celebrate such occasions. I hope that you are well and enjoying the day off wherever you call home. 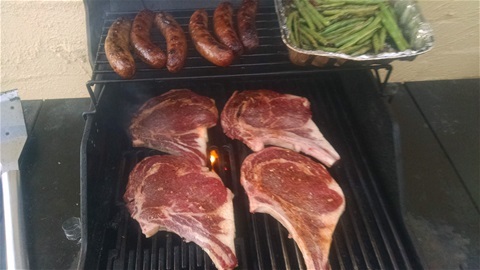 It was a beautiful day here in Arizona as I ended the day cooking out for a few of my relatives. I actually work today for a few hours, helping a friend of a friend move into her new home. It was the 14th day in a row I work, something I don't want to get used to doing. This is the busiest I have been in a very long time, and it has brought me to the point of exhaustion. As you know I much rather be sitting down in my office writing, what bills need to get paid and sometimes I just have trouble saying no to people. So these past couple of weeks that I work Non-Stop, I just get home with enough time to eat something and crash on the couch exhausted. Kalani is not too happy that she's not getting the normal attention as well. In this contracting world that I survive in, it is either feast or famine. It seems to be busy everywhere I hear, as the economy improves all over the country, and they're obviously is a high demand for handyman\ tradesman like myself. So with that in mind, I need to cash in on the bonanza while the getting is good, because we never know when things take a turn for the worse. I also wanted to work as much as I can since I expect my kids from California to visit me later on this week, and I wanted to take a few days off with them. So staying busy working while my manuscript continues to be worked on is good medicine for the mind I suppose. It certainly helps time fly by. Speaking of time flying by, it was exactly one year ago this week I was in Hawaii completing my 50th stop on my tour. Hosted by my good friend Yohana in the North Shore of Oahu, it brought an end to the most exciting and journey of my life! I tell you that adventure tested my will and endurance to the limit, but now this publishing process is coming in a close second! I truly enjoyed the great majority of my stops, but my time on the island was special and very relaxing to say the least. I had planned it that way from the beginning, and it sure turned out to be the best thing for me at the time. If you have never been to Hawaii, you will never regret trying it at least once in your life. I still feel I feel I will end up there someday for good once again, making it my permanent residence again. Who knows when that will be, but I sure miss the warm waters, friendly people, and especially the food. I guess I should stop looking at all the pictures of my time there and focus on the here and now.